What compliments would you like to give? What compliments would you like to receive? 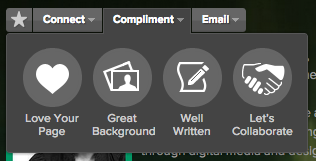 We’re looking to add more compliment options and we wanted to ask you what you’d like them to say! But we’d like to hear more ideas from you. What do you think? Let us know in the comments here. 20 responses to Choose our new compliments! Want to grab a coffee one day? I’m a fan! Want to meet? Your title is missing ‘Rockstar’! “Like” and “Favorite” are enough to compliment the content & design. However, I really like the action choices more (collaborate, meet, hire, …, etc). Care to have a cuppa? Free Text! People don’t like being restricted to a preselected list to decide on, and I’m one of them. We are human beings with the ability and capacity for free, creative thought. Every major collaborative network on the internet gives members the ability to say exactly what they want to say. And you think you have something special going on here, while you keep a leash on free speech. Allow members to visit other members, and say exactly what they want to say. Add a comment section to allows your members the ability to speak freely! I think you might add a ‘page suggestion’ button too, although this might be private. I know a lot of people I’d like to make a suggestion to!